The restored Edwardian cell block provides office space and meeting rooms with the ‘wow’ factor. The Orkney Street Enterprise Centre provides attractive, accessible and multi-functional space for a diverse mix of local businesses and community support organisations. 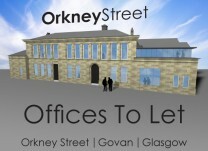 The building was restored as part of the Central Govan Action Plan during 2007 and 2009, and now offers state-of-the-art office space ranging from 800 to 2,800 sq ft. Its undoubted centre piece is the restored Edwardian Cell Block, where the converted cells provide a real wow factor as serviced office space for small and fledgling businesses. The £3.6 million refurbishment, led by Glasgow South West Regeneration Agency, has successfully preserved the unique architectural legacy of this exceptional building. The restoration also provides economic and social benefits for the Govan Community. Day-to-day users of the building, including Jobs and Business Glasgow, Money Matters Advice Service and Govan Law Centre, are key access points for advice and assistance for the local community. Orkney Street is also home to private businesses and the Central Govan Action Plan and Govan Cross Townscape Heritage Initiative Team, all helping to increase the number of people working and spending in Govan’s local economy. The B-listed building at Orkney Street was designed by John Burnet Snr and was originally completed in 1867. It served as Govan’s original town hall, fire station and, most notably, the police station from the days before Govan merged with Glasgow, right up to the final decade of the twentieth century. The building lay derelict for nearly 10 years before being transformed to once again play a vital role in the life and prosperity of Govan. Funders: Glasgow City Council; Strathclyde European Partnership; Historic Scotland, Entrust, Communities Scotland; Glasgow Housing Association; Scottish Enterprise; Local Community planning Partnership; Clydesdale Bank. Project Team: Glasgow South West Regeneration Agency; Glasgow Building Preservation Trust; Brett Nicholls Associates; Wylie Shanks Architects; Hunter & Clark (Contractor). Current Status: Complete. This project was opened in Summer 2009 by Sir Alex Ferguson CBE.